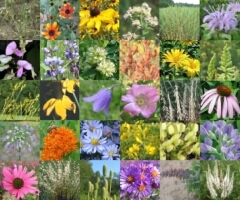 Highlighting the stunning diversity and beauty of the tallgrass prairie; this delightful selection offers the broadest spectrum of perennials available in any of our specialty mixtures. Filled with favorites like the vivid red 'Royal Catchfly' and the deep fuschia 'Blazing Star', 'Aurora of the Prairie' will create breathtaking beauty to captivate the wild at heart. 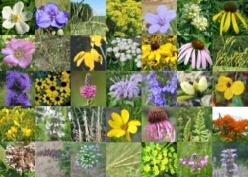 If you would like to take a more detailed look at this wildflower seed mix in chart format, click here. Create a paradise of serenity and beauty out of your wet areas! Everwilde blends flaming 'Cardinal Flower' with the gold 'Marsh Marigold' and periwinkle 'Blue Lobelia', accompanied by bold sprays of lavender, pink, and blue; all enveloped in lush foliage to perfect your planting. Invite Nature's artistic touch to paint a delightful picture of lasting beauty on your property. Soak yourself in radiance and quiet beside the still waters. 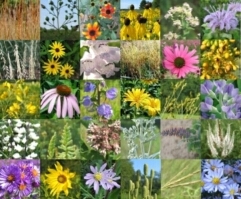 If you would like to take a more detailed look at this wildflower seed mix in chart format, click here. Envelop your prairie in a potpourri of fragrance with this delightful blend. Each heavenly plant is hand-picked for its special, distinctive scent. From the 'Pasture Rose' to the 'Shooting Star', this delightful mixture is your gateway to paradise. 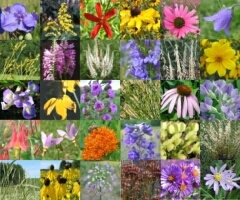 If you would like to take a more detailed look at this wildflower seed mix in chart format, click here. Captivatingly radiant and lovely, this distinct mixture features a beautiful selection of prairie cut flowers. Suited to grace a bridal bouqet, you will also enjoy the vivid panoramic display of these favorite perennials. 'Wild Columbine', 'Harebell', 'Tall Larkspur' and many others promise to make every occasion delighful and memorable. If you would like to take a more detailed look at this wildflower seed mix in chart format, click here. Want to see some color around that wooded lot with a cabin on it? Try our "Hundred Acre Wood" mix. This mix is designed for dry, sandy soil that is somewhat shaded. If you would like to take a more detailed look at this wildflower seed mix in chart format, click here. 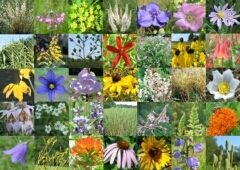 Everwilde has blended well known wildflowers to provide a classic mix for your prairie meadow. You'll love its timeless beauty! Sowing our high quality Meadowlark mixture provides you with the golden opportunity to bring your dreams to life. If you would like to take a more detailed look at this wildflower seed mix in chart format, click here. Invite the colors of Nature to your prairie with our 'Prairie Jubilee' mixture. This chorus of time honored favorites include 'Butterfly Weed', 'Purple Coneflower', and 'Button Blazing Star'. 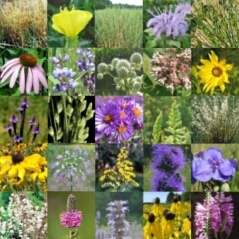 Each charming addition will add harmony and joy to your prairie planting. 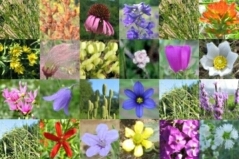 If you would like to take a more detailed look at this wildflower seed mix in chart format, click here. Many wildflowers and grasses gain enhanced germination from several months of cold condtions. Since many people do not want to take the time or effort to artificially treat the seeds for a spring planting, we came up with a wildflower seed mix that does not need any pretreatment! 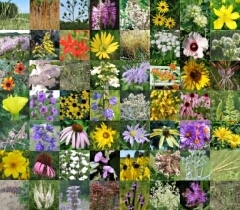 This wildflower mix is designed with shorter species, resulting in a planting about 4 feet tall. If you would like to take a more detailed look at this wildflower seed mix in chart format, click here. Many wildflowers and grasses gain enhanced germination from several months of cold condtions. Since many people do not want to take the time or effort to artificially treat the seeds for a spring planting, we came up with a wildflower seed mix that does not need any pretreatment! This spring mix is especially for dry, sandy areas. If you would like to take a more detailed look at this wildflower seed mix in chart format, click here. Turn your dryland prairie into a oasis of color with our beautiful 'Starlit Desert' mixture. Combining the brilliant blue stars of the 'Prairie Blue-Eyed Grass' with the radiant fuchsia blooms of the 'Button Blazing Star', we have created a large selection that will enchant your landscape. 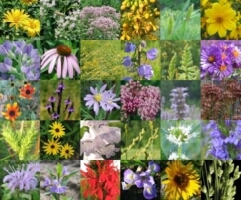 Hardy and resiliant, these low maintainance perennials will bring refreshing hues of life and color back to your prairie. 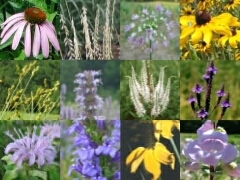 If you would like to take a more detailed look at this wildflower seed mix in chart format, click here. Many wildflowers and grasses gain enhanced germination from several months of cold condtions. Since many people do not want to take the time or effort to artificially treat the seeds for a spring planting, we came up with a wildflower seed mix that does not need any pretreatment! 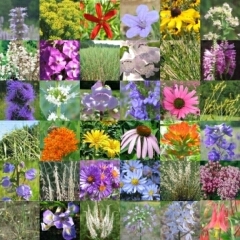 This wildflower mix is designed with short and tall species, resulting in a planting about 6-8 feet tall. 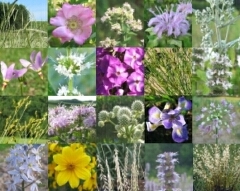 If you would like to take a more detailed look at this wildflower seed mix in chart format, click here. 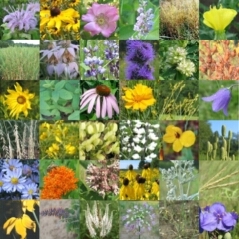 This mix was designed for small areas where too many species simply would not work well. Tiny, but mighty! 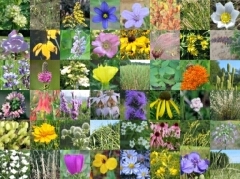 These species are very reliable and hardy, and will come back to grace your landscape year after year. If you would like to take a more detailed look at this wildflower seed mix in chart format, click here. Imagine your landscape filled with nodding flowers and grasses, beckoning graceful visitors to its radiant display! Beauty invites! Expect to hear the whisper of wings in your delightful haven especially designed to attract and feed Nature's winged creatures. Hummingbirds, Monarch Butterflies, and other feathered friends will fill your summer with the joy of living. From the Columbine's triumphant spring entry to the Aster's exploding finale 'Whisper of Wings' provides a long selection of color and food. Enchanting! If you would like to take a more detailed look at this wildflower seed mix in chart format, click here. Have something in mind that you do not see here? No problem! We can custom design a mix specially suited to your site conditions and desires. Please call us at 1-888-848-EVER, or E-mail us at Steve@Everwilde.com.